Next post: Opening of the first one! Pride of Düsseldorf is a joy to grow. Just plantnitnand off it goes. I have a thrift sadly I don’t know it’s name. It looks bedraggled and sad during the winter but boy late spring it comes into it’s own. Will put it in my blog next week. Good blog as always. I am glad someone else likes the perennial geraniums! They do spread themselves about but go on a long time and can be dug out quite easily. I’ve not seen a rose bud like that before – very unusual. Oh yes I love them 😍 did have over 250 different types many years ago, that number is so sadly reduced now but may have about 30 now I think, I need to list them! Like me, you showed us your armeria maritima this morning. Mine looked like yours last year and you will soon see that it has doubled in size in one year! A very beautiful flowering you’re right. About the Niwaki , I ‘m looking forward to seeing the result but I will have to wait a few more years …. It’s odd. Being North of you, things here are supposed to be that bit later. Not much but that bit. My Armeria have almost all done their bit and gone over now yet yours are just starting to flower. And I have roses with buds opening. Maybe it’s the sea air wot does it. And a nice six as always from you. I’ve got a couple of phaeums in my selection this week as I try to work out the difference; at least the mottled leaves of yours are an obvious characteristic. Does Jake’s technique involve stringing the tree to promote the right growth direction? Looks like you are doing that. Interesting. Niwaki…now I had to look that up. It sounds very interesting, hopefully we’ll see more posts about it. Derek the geranium is very nice. I’d like to have some of those being a nuisance in my garden. Love the moss rose bud. I am looking forward to the roses this year. I just ordered some Tonic so will give them a spray this week some time. They all look pretty healthy so far. Good job on your pruning! Nice selection of plants – love the sea thrift and isn’t it exciting waiting for those rose buds to open. 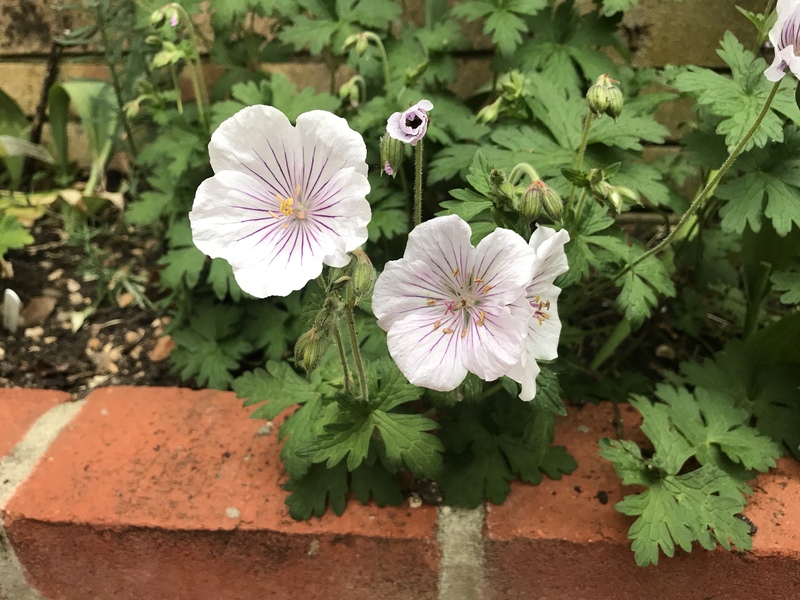 Geraniums have taken over in our garden – not sure of the variety as they were here when we arrived. That first one is cool, but knowing that it is a geranium makes it sort of freaky. They aren’t supposed to look like that! However, that allium looks exemplary. Is that typical for them? I have never tried them. They are mail order here, not in nurseries.